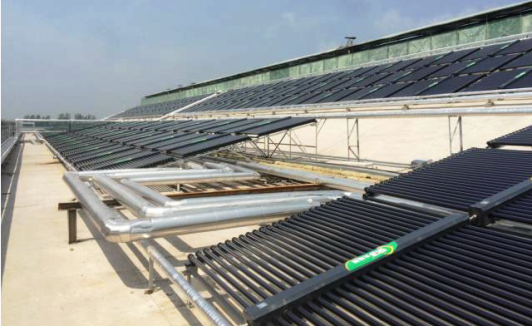 Last year, Chinese vacuum tube manufacturer Huang Ming internationally known as Himin Solar installed its largest system for solar process heat to date. The company said that it had set up a 9,903 m² installation in Shandong province in October 2015, a system which had since produced heat for a textile factory owned by the Ruyi Group. The RMB 12.46 million (EUR 1.66 million) project had been entirely financed by the customer, which had not received any public subsidies. Ruyi had had the plant built because of a lack of electricity. “The local government had restricted electricity supply to Ruyi, which meant that the business could no longer fulfil its annual output targets,” stated a press release by Himin. “Himin designed the system and was responsible for delivering all components as well as finalising the installation,” explained Shaomin Li, Himin’s Sales Manager for the southwest of Shandong province, who had overseen the Ruyi installation. The collector field was installed on several roofs of the dyeing factory and connected to two non-pressurised tanks. It provides solar heat for the dyeing process at 60 °C as well as for the workers’ showers. First, tap water is supplied to the decalcification unit, where solar heat from the tank will heat up the fresh water via heat exchanger before it is directed to the dyeing workshop. If solar-heated water alone does not achieve the target temperature, steam will be taken from a district steam network to get the water to the correct temperature level. The externally purchased steam is also utilised to cover the heat range between 90 and 100 °C in the factory. Ruyi has a backup steam system driven by electricity, in case the steam supply does not fulfil pressure or temperature requirements. The solar installation helps to save electricity, which makes it possible for the production facility to achieve output targets as described above. According to calculations by Himin, the solar side of the textile factory has a payback period of 4.6 years, making it economically feasible. The formula is total solar yield per year divided by the average heat content of 1 tonne of steam which is 1,583 MJ/tonne (see the table below). Based on this formula, solar heat saves 13,538 tonnes of steam annually or RMB 2.7 million at a price of 200 RMB/tonne of steam. Comparing the annual saving to the total investment of RMB 12.46 million will result in the aforementioned payback period of 4.6 years. Solar thermal specialist Yaping Zhang, a solrico partner based in China, contributed to this article.